In addition to house made pastas (5 course tasting menu Thursday nights! ), focaccia, and ice creams, RoCCA too is a locavore at heart. It makes every attempt to source ingredients locally and seasonally. RoCCA proudly lists its farm partners on the menu like Filet Mignon with Cherry Grove nicola potato gratin and Shibumi Farms king oyster mushrooms or Fernbrook Farm Cream of Cabbage Soup. Plus, like many NJ restaurants, Rocca is a BYOB, so we were able to keep our dinner even more local with some rich Long Island wines. Right from the start I knew we’d get along. 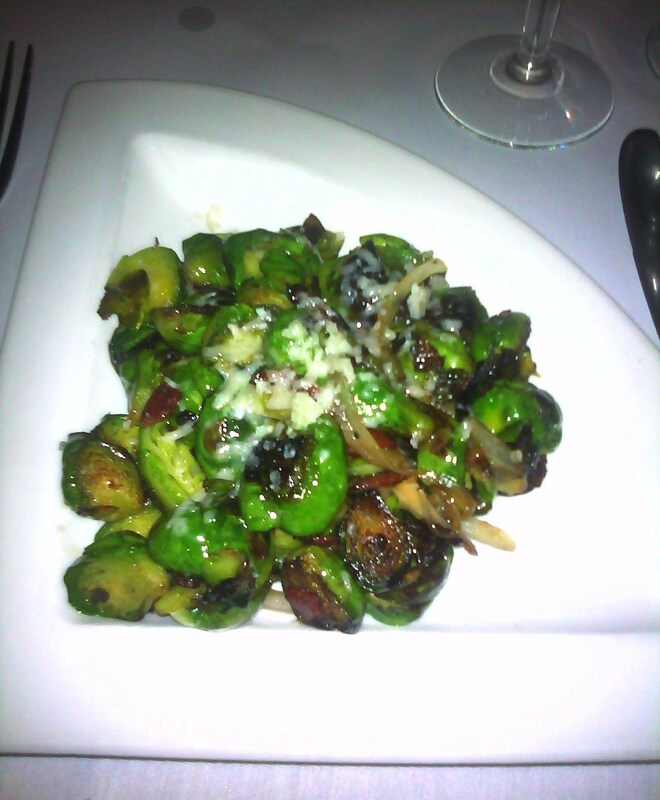 The first thing that caught my eye on the menu was Brussels Spouts…with bacon…as an appetizer. Now we’ve all see Brussels Sprouts piled on high along side tender cuts of beef or even as a family style side dish to share with the table, but never have I seen a stand along appetizer featuring these beautiful little morsels. I might have squealed a little. Being a sprout fanatic, I just couldn’t pass it up. The sprouts were tender with a little crunch and brilliantly seasoned. The sprouts were followed by an (even more amazing? still not sure) Goat Cheese and Potato Gnocchi with roasted fennel, wild mushrooms and black truffle butter. 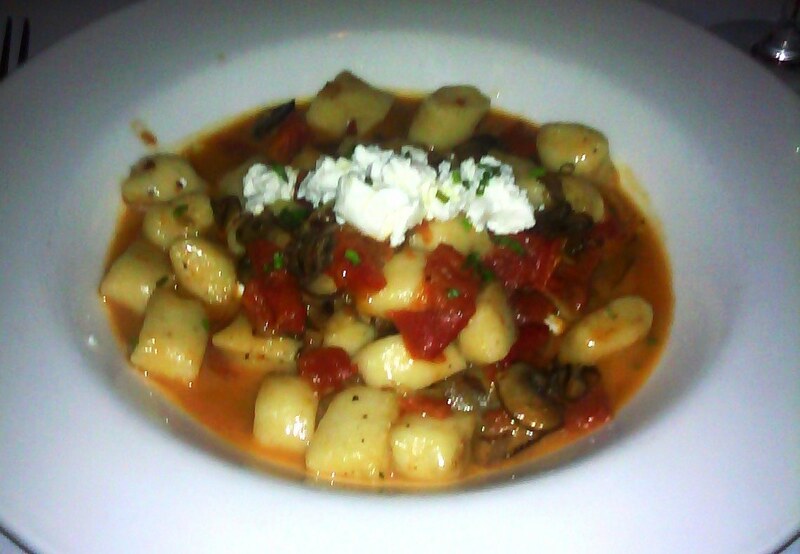 Each morsel melted in my mouth, I could have sworn the gnocchi was made of pure butter as well. If I’m in a pasta mood and there’s gnocchi, I usually go for it, but I want to stress that all of RoCCA’s beautiful pasta dishes start with house made pasta. I know what you’re thinking, I live in Brooklyn, I must have homemade pasta all the time. Wrong. You’d be amazed how hard it is to find homemade pasta around me, and for the good stuff? You really have to search. It always made me a bit sad that the best homemade pasta I’ve found around me comes ironically from Petit Oven–a French restaurant with a Polish chef. So, yes, homemade pasta is a treat and BRAVO! to RoCCA for taking on the challenge so deliciously. I would love to tell you about dessert, describe the amazing flavors of homemade ice cream I sampled, but alas, like most Italian restaurants, I found Rocca’s courses to be a bit generous. Sure, I could have taken some home, saved room for dessert, but in the heat of the moment, I could only focus on bite after delicious bite. But have no fear, RoCCA, I will be back for more. RoCCA’s menu changes weekly, so what you see on their website might not always be there when you arrive. No matter though, you won’t have any problems finding something you like (though narrowing down might be an issue). And because I’m from Brooklyn and mainly a pedestrian, I need to bring this up. RoCCA is a simple train ride from Secaucus or Hoboken, unlike some other NJ suburban restaurants that require a train and a bus and a 2 mile hike on foot to get to. It’s conveniently located in downtown Glen Rock making it a great for city dwellers coming into town, or a nice place for the Bridge and Tunnel crowd to enjoy Friday night dinner on their way home from work.